Chicken thighs, potatoes roasted in spicy Cilantro / Coriander Chilli Sauce. This one-pan roasted Chicken is an ultimate weekday dinner recipe. I always store chicken in my freezer. And when I don’t get any idea about dinner or say am not in a mood to have roti and sabzi(Curry), I just defrost chicken and either bake them or pan fry. So the search for interesting recipes with Chicken is always on. A good spice rub or a sauce will do wonder to the entire dish. 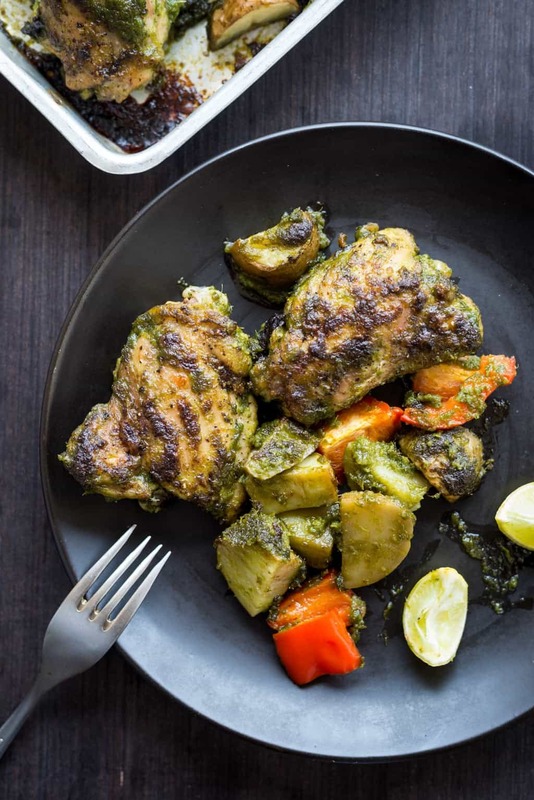 Different spice rubs like Cajun,Sumac, Zatar or Tandoori Masala can be used for the marination. This time I have used some fresh coriander, chilli and garlic as the marination and a good squeez of lemon just before serving. Baking chicken always seems tricky especially with boneless chicken breast fillets. Cooking them little longer than required will result in tough rubbery meat. To get a perfectly cooked fillet keep all the fillet of equal thickness. And once it is baked, let them rest for some time so that it will cook further and become perfect. Unlike Chicken breast, chicken thighs are always safe to cook. They don’t get dry too easily. So if you are still unsure about cooking chicken breast fillets you can go for thighs. Again chicken thighs with bone on turns super juicy when baked. I have used chicken thighs with bone on. I would have prefred thighs with skin but couldn’t get hold of any. You can also use breast fillets or any other parts of chicken and adjust the baking time accordingly. 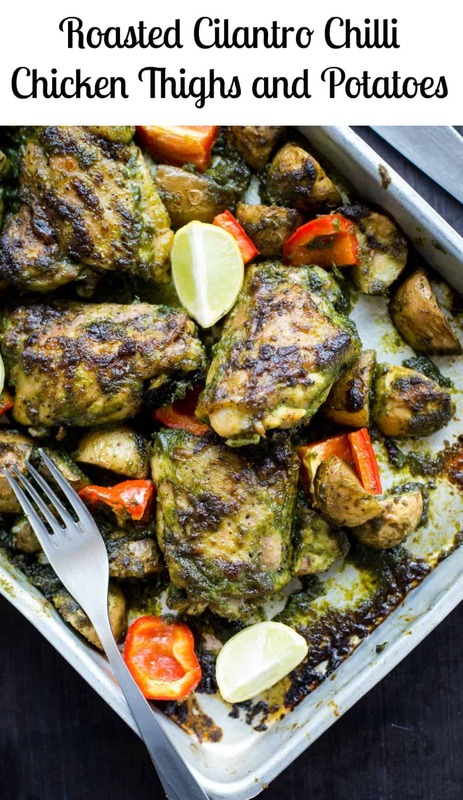 Chicken thighs, potatoes roasted in spicy Cilantro / Coriander Chilli Sauce. 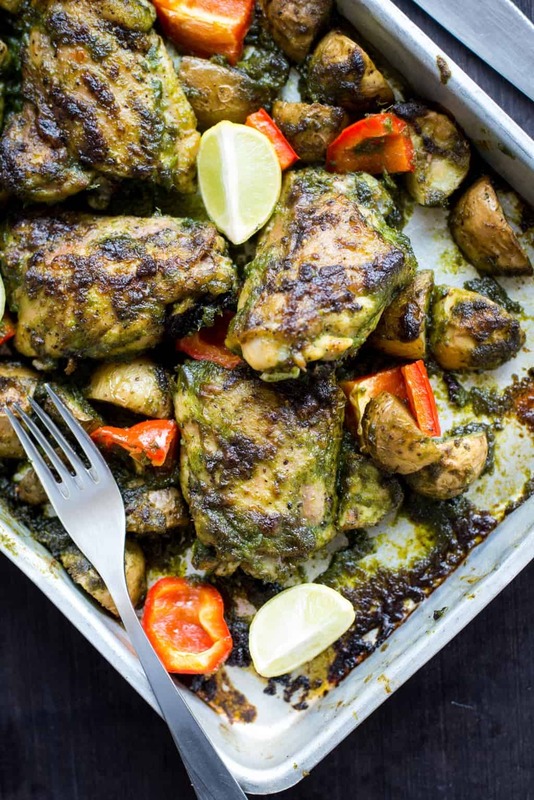 This 30 minutes one-pan roasted Chicken is an ultimate weekday dinner recipe. In a food processor add all the ingredients mentioned under sauce except oil. Add very little water if required and blend everything to a fine paste. Pre heat oven to 180 degree. After browning of chicken is done , in the same pan toss cubed potatoes and bell pepper just to coat any residual oil in the pan. 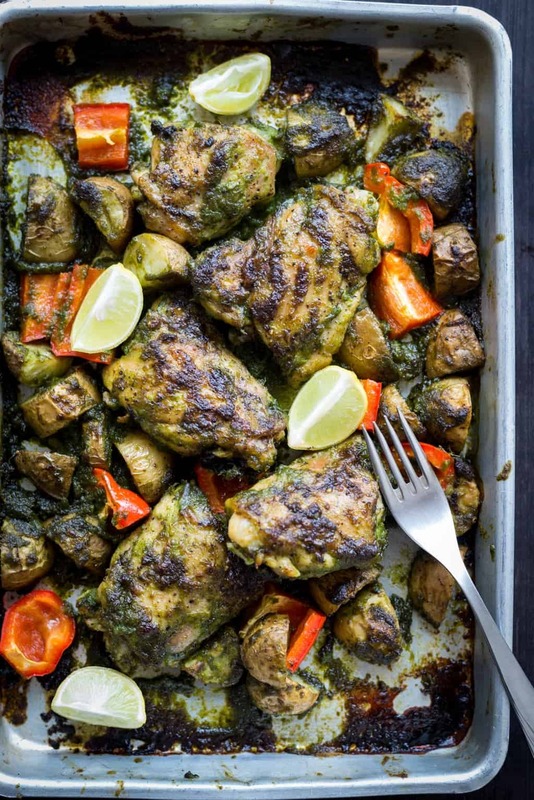 In a rectangular pan arrang chicken and veggies in a single layer. Spread the sauce. Make sure chicken and veggies are well coated with the sauce. Bake for 25-30 minutes or till chicken is cooked through. To roast a little extra just before the baking ends, I have broiled it for 8-10 minutes on high heat. Before serving squeeze lemon juice generously. Made this today and it turned out to be outstanding! Thanks for the recipe! Do you really only heat oven to 180 degrees? Is in Celsius I’m assuming so it would be 350 degrees Fahrenheit.